iTunes might be the default and the most used application through which you can transfer music to your iPod, but it’s not the only one. Some users have been facing extreme difficulties while trying to navigate through iTunes in a quest to add music to their iPod. Sometimes, people also have a bad internet connection which means that they’re unable to download iTunes and thus cannot copy music to their iPod without bypassing iTunes. There have also been some content erasing issues with iTunes in the past, so in fear of having their favorite music getting deleted, people try to search for the existing alternatives to iTunes. iMusic is a one of the most amazing tool which will solve all your music related problems in an instant. The software has multiple amazing features. One of the most tiresome tasks that any audiophile dreads to face is transferring the music you love to your iPhone/ iPad through your computer. However, now with the “Transfer” feature that iSkysoft has to offer, you can move your music files, podcasts, playlists and TV shows to all you Apple products in mere seconds. Moreover, now you don’t ever have to worry about losing your playlists again since you can create backups of your music collection. You can also copy any music files from your Apple products to your iTunes library easily and without any duplicate tracks. This makes it an ideal candidate to transfer music to your iPod, and moreover, it comes with extra perks. The software has different versions for Windows and Mac OS X. So, let’s go through the simple steps in which we will transfer mp3 files to your iPod though iTransfer. Step 1: First of all, you have to make sure there is a connection between your Mac/PC and you iPod by using a USB cable. Also ensure that you’ve installed iMusic on your computer. You can download iMusic from the links below. Step 2: Now, click on the “Device” Tab and hit the Music icon, select the “Add” option which is present on the right side of the screen. On your screen, you will see a pop up window which will ask you for which files to select and transfer to your iPod. In some cases, you might have some files that are incompatible for iPod because they’re in different music file types. However, don’t worry. iMusic will convert these files into compatible music file types so that they can be transferred. Now, enjoy the music on your iPod! Do you know that you can also use iMusic to directly transfer music from your iTunes library to your iPod? Well, now the method is even easier, and can be completed in simple easy steps. Step 1: First of all, open iMusic. You have to ensure a connection between your computer and your iPod using a USB cable. The connected iPod can now be seen in iSkySoft device window. However, sometimes you may not be able to see this option. To counter this, go to your apple device and select “Trust this computer”. Step 2: In your iTunes Library, each and every song that you have is displayed. 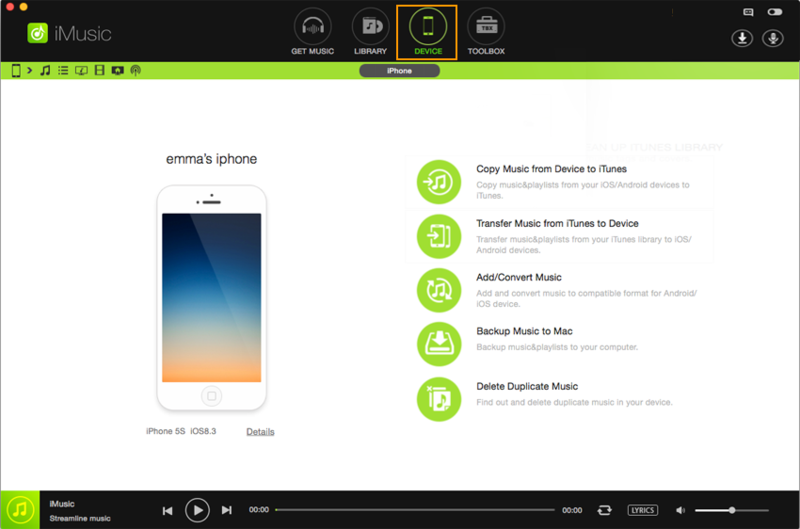 Select the songs that you want to transfer to your iPod by syncing. 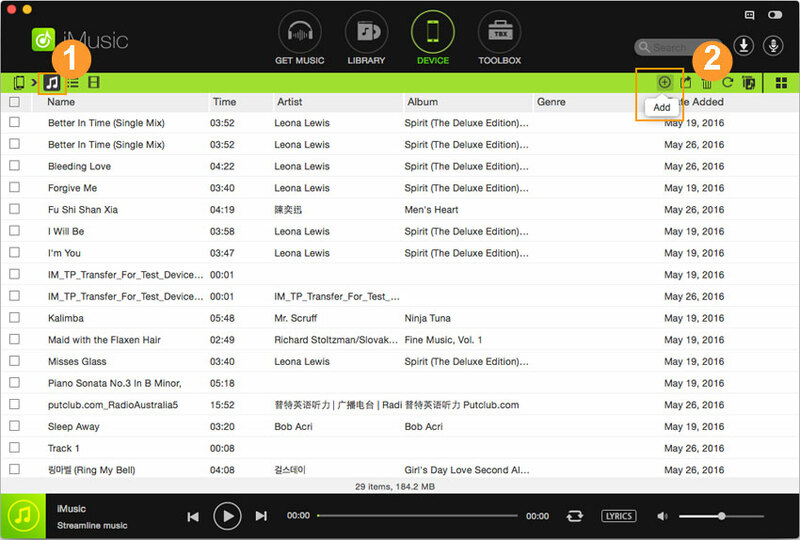 Now, select the export option that is displayed on the top right side of the window, and then choose the device which you want to export the music to. Sometimes, you might get tired with an Android phone, so you change to an iPhone or an Apple device. 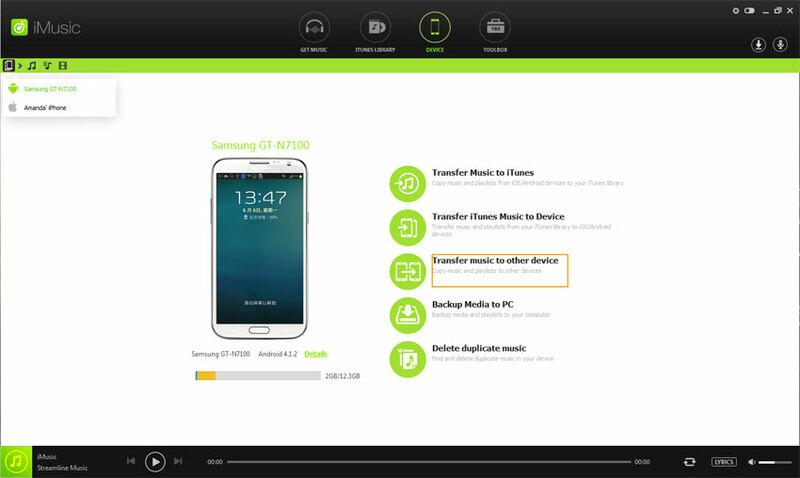 Now, you wouldn’t want to lose your music at all, and would love to transfer your music from the android device that you were using to your iPhone/iPod/iPad. 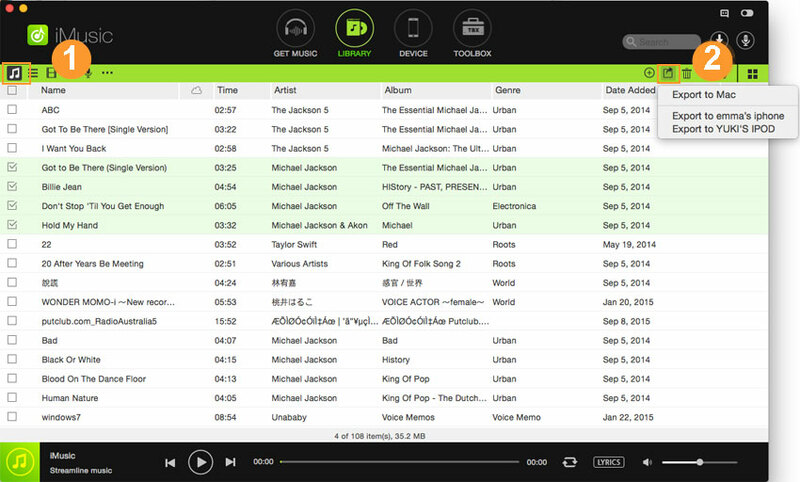 To complete this task, there is no better software in the market than iMusic. 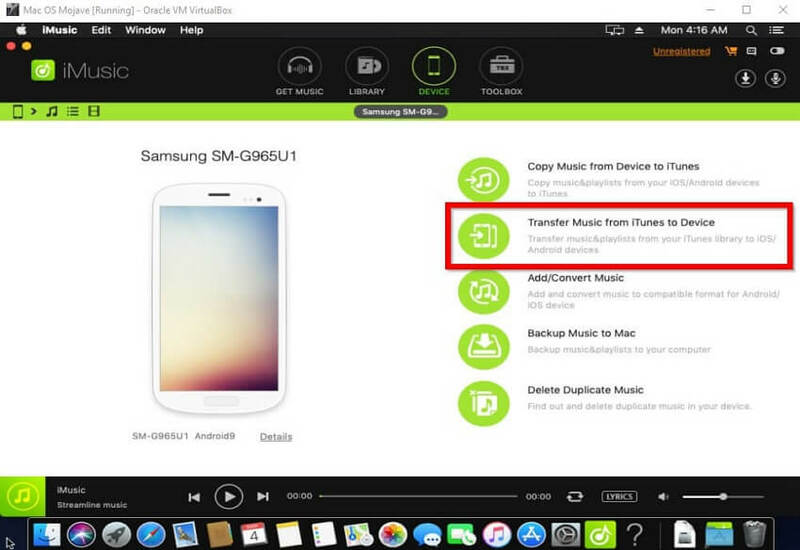 Now, let’s run through the steps that will be used in case you want to transfer music from your Android device to your Apple device. Note: This feature is only available on iMusic Windows version. Step 1: Firstly, you have to install the iMusic software and then make sure it’s running on your computer. Next, you will have to connect your computer with both your Android device and iPhone device through two USB cables. Then both of the devices will be presented and can be seen under the Device menu. Step 2: However, in some instances, there might be a slight problem. Sometimes, the Android phone doesn’t get recognized. To counter this, enable USB debugging. 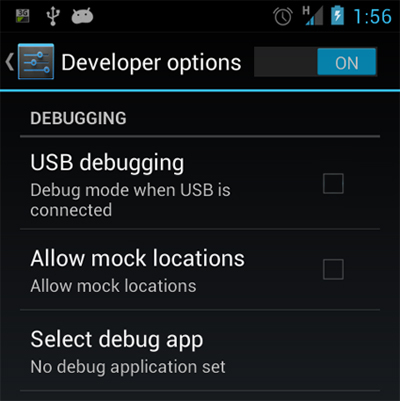 An option that is present in the settings of your Android Phone. For the Apple device, you need to click on “Trust this computer”. Then select the Android device by clicking on Device tab at the top left menu to display the information of it. Now, you have two options on how to proceed with the next step. Option 1: Select the option of “Copy Music to Other Device” in which you will now click on the Apple device that was connected. 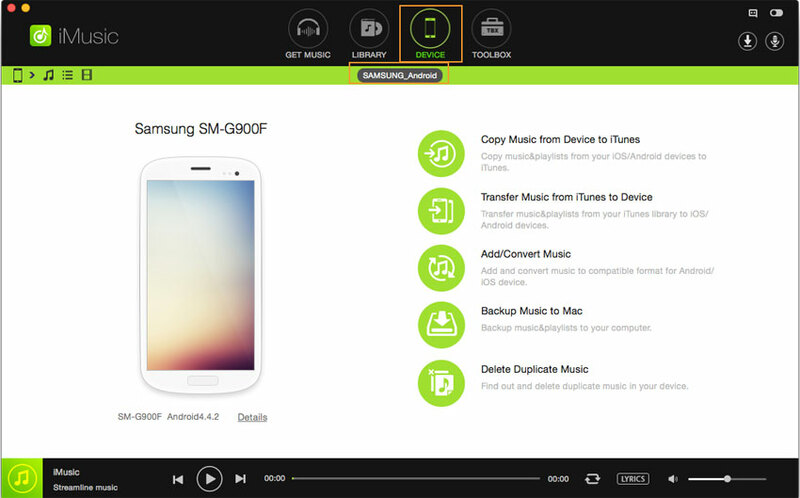 This will now transfer ALL songs that you have in your Android phone to your Apple device. Option 2: You can also choose which songs to transfer and which not to transfer. To do this, select the music icon which is placed just below the device icon on the left side of the window. 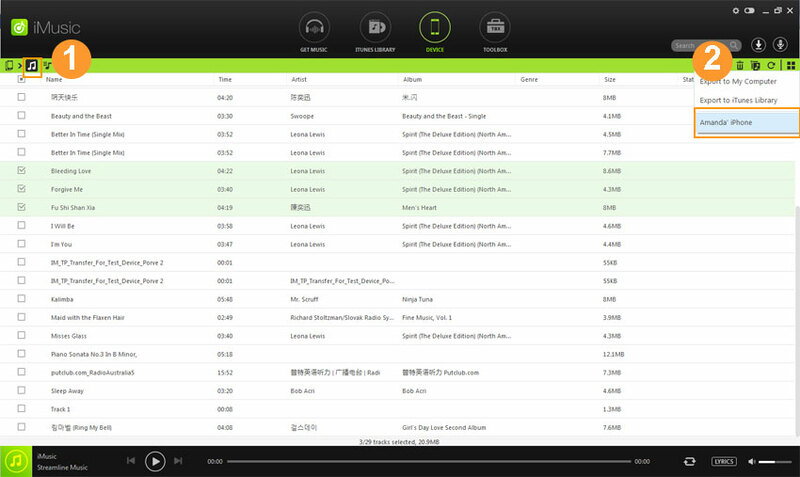 Now, this will show all your songs that are present on the Android device. Click on the export button that is present on the right side, and then choose the device that you want to transfer to. That’s it! Now, Enjoy music on your new Apple Device! Suppose your friend copies some songs for you and gives them to you in a USB flash drive. Now, since you would love to hear those songs all the time, you might want to put them in your iPod, but how? Well, it’s quite easy with iMusic. Let’s take you through the steps that are needed to add songs to your iPod from the USB flash drive. First of all, connect your iPod to your computer using a USB Data cable. Connect the USB Flash drive with the computer. Now, both these two devices can be seen in iMusic. Click on the option of “Copy Music from other device” to transfer songs from the USB Flash drive. Now, select the device icon that is present on the left side of the window, and choose your Apple Device i.e. iPod. Now, all the music will be transferred to your iPod from your USB Flash drive!